Mounting a camera on the headlight might sound like a good idea, and some of the headlight manufacturers even supply it as a part of their product line. The Luxtec Corp., for example, has the MicroLux headlight camera, which can be used with their headlight systems. 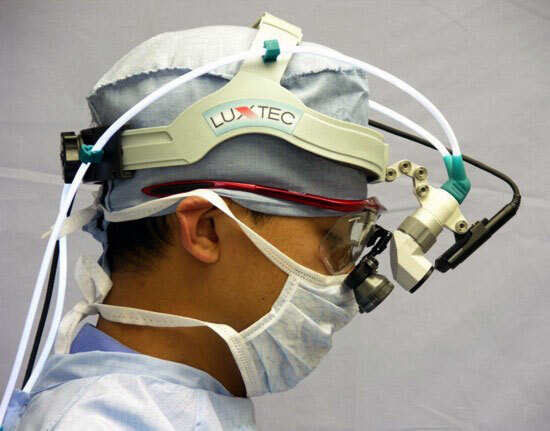 I’ve chosen Luxtec as an example because their own sample videos of the camera reveals the problems of the headlight camera when shooting surgery. Look! No hands! No heads! One big advantage of the headlight camera is that you don’t get any surgeons’ heads blocking your view. Because the camera is mounted between the surgeon’s eyes you don’t get many hands in the way either. The camera sees more or less what the surgeon sees. But there ends the advantages of the system. Even the most focused surgeon does not hold her head locked in position. A headlight can be annoying when shooting surgery, because it is an ever moving light source. The same applies to headlight cameras. The picture is erratic and tiresome to watch. A picture which is always moving and jumping is not pleasant to watch, and consequently unfit to keep the viewers attention. A good example of this can be seen at the Luxtec Corp.’s own pages. Watch the sample video (eyelid surgery) here. With longer focal length, camera movement becomes more visible (and annoying), so most of these cameras comes with a fixed, wide angled lens. As you can see in the Luxtec sample video, this results in a good overview of the operating field, but with no possibility to get a closer view of the anatomy and dissection. “Small” and “light” are maybe good advertising words, but when it comes to video cameras they can most often be translated to “single CCD” and “inferior optics”. The MicroLux camera boasts of having both “automatic picture adjustment” and “hands-free auto focus”. To the surgeon this might be helpful features, but in small cameras like this “automatic” means you don’t have the option to adjust exposure and focus manually, which is crucial for consistent quality pictures. 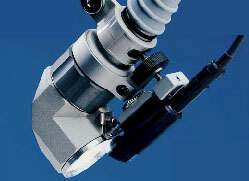 The head- or headlight-mounted camera is not an optimal solution for shooting surgery, and should not be used as the main video source in a production. It can however, sometimes be interesting to include the surgeon’s view of the procedure. Especially in videos used to train other surgeons. As a medical videographer I’m not comfortable with making the surgeon responsible for the quality of the footage. This system puts the surgeon in control of the camera, but at the same time denies her monitoring of the picture, as the camera always follow her eyes. In my opinion that is not a recipe for quality. Luxtec are right when they say “Overhead cameras just don’t get the picture”. The only problem is, headlight cameras don’t get it either. This is the second post in a series about different ways to shoot surgical videos. First post: Surgical light cameras. Interesting post. I recently tried the headlight mounted camera. I agree that it would not be appropriate for videography. Not nearly stable enough to be useful. However, our OR staff like the fact that they can look at a monitor on the video tower and see what the surgeons are doing. It helps them anticipate instrument and equipment needs and stay involved in the procedure even when it is hard to see what is going on. Both headlight and surgical light cameras are indeed useful for monitoring the procedure. I’m working in ORs both with and without CCTV, and there’s no doubt that OR staff appreciate video monitoring. As you say, it brings them closer to the actual surgery. Headlight cameras have the advantage of being moveable, and thus provides a more cost effective solution than installing cameras in the surgical light of every OR. I am an Outpatient Nurse Manager at Cleveland Clinic. There is a Surgeon that has long been interested in a camera such as this. Would an area Sales Rep. have a Headlight Camera available for this Surgeon to try? We were concerned that the picture may not be stable enough when we wanted to use these images for educational purposes. I do not represent a manufacturer or seller of headlight cameras. This post is just my experience with using these kinds of cameras. We have two surgeons here who use them regularly.I need to have a second headpiece as the first one is now broken!! I need to replace quickly, please can you point me in the right direction? Hi, i´m looking for a head camera to record my surgeries, is there anything like wireless camera? or maybe with a cord but its works great. thanks I appreciate you help! I’m sorry, but I’m not familiar with other products than the one mentioned in this post. It gave me the best videos I have never seen of my surgical procedures. Checked out this model on the web. It appears to be what I am looking for recording open surgery. Is it head mounted or on a clamp in the OR light ? No costs are mentioned online. How much does it cost? As a surgeon in a charitable hospital in India, cost is important for me. The sony HXR- MC 1 appears similar on the surface, it might, however, have a wider field of view making it less ideal for surgical videos. I have no hands on experience with this model. Any update on good head mounted video cameras yo record nasal and septal surgery? I am a spine surgeon who has been chasing this concept for years. Head mounted=the erratic movement described above, and nobody has a lipstick camera with 1080i resolution for true high definition. Best is a HD videocam mounted on a tripod-type clamp, clamped to overhead surgical light. Have a remote control handy. If you want the headcam, get a Sony lipstick from datatoys.com, and input to your laptop using the Apple translation product (converts video from any source so goes into iMovie). Hands down the best headlight camera I’ve seen is the BFW HD CoAx camera. Its 1080i and is delivers an image coaxial to the headlight spot. This camera also has a zoom feature. The BFW camera is only SD (PAL or NTSC), it is NOT HD. It has an upscaled DVI/HDMI output, but the camera only captures analog SD video. what is THE BEST product currently on the market? looking for a camera system to record cardiac surgical procedures. any help is much appreciated. The Futudent camera is a very nice HD camera that makes filming very easy and effortless, with good HD image quality. The BFW HD CoAx camera is not HD, it is analog Standard definition (PAL/NTSC: 720x 576 pixels = 0,4Mpix), though it has DVI/HDMI output. You are currently reading Headlight cameras at The Sterile Eye.